The reputation of the early Charlie Chaplin short The Face on the Bar Room Floor has been sullied over the years due to the condition of the existing film elements. 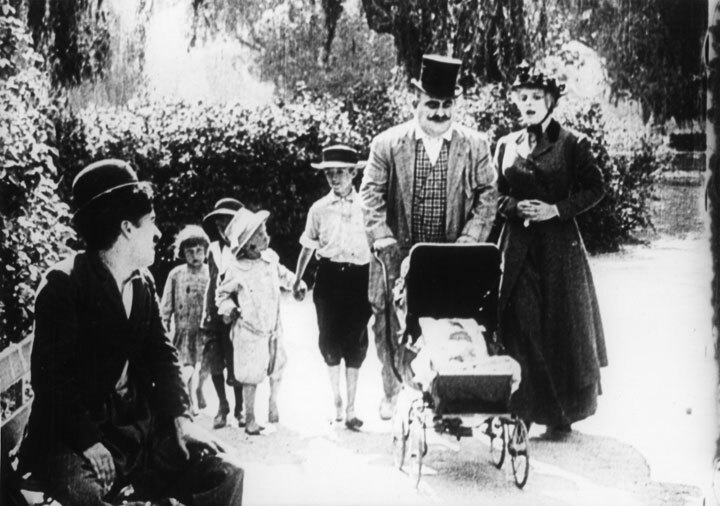 Modern critics approaching the film for the first time are often confronted with ragged, incomplete prints with choppy images, missing or rewritten intertitles, and scenes assembled in the incorrect order. Naturally, the resulting reviews have been more harsh and dismissive than the film deserves. 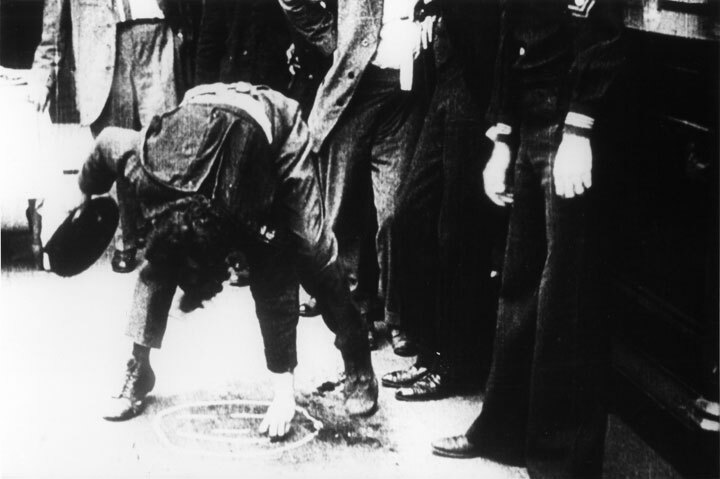 This is a shame, because The Face on the Bar Room Floor is one of the most ambitious and successful of the Keystone comedies that Chaplin produced during his first year in the movie business. The Face on the Bar Room Floor was Chaplin’s first attempt at parody, satirizing a popular Hugh Antoine d’Arcy poem of the same name. The poem, which was well known to 1914 audiences, relays the story of a vagabond who enters a saloon and begs drinks off the barflies in exchange for telling the tale of how he was laid low. According to the drifter’s story, he was once a great artist, but he turned to drink after the girl he loved ran off with a fair-haired youth. After relaying the narrative, the vagabond sketches a picture of his beloved on the floor of the bar and falls upon it dead. Chaplin’s parody of the maudlin ballad follows the narrative of the poem fairly closely, even using direct quotes from d’Arcy’s verses in the title cards. 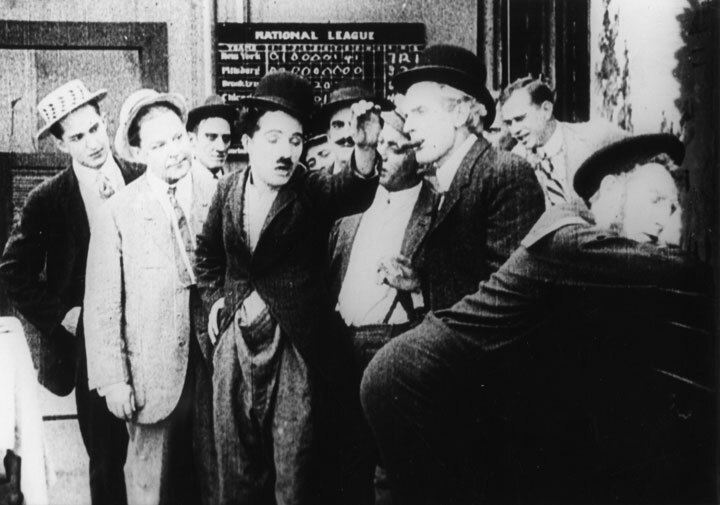 However, Chaplin’s reenactment of the familiar story exaggerates (and occasionally contradicts) the described actions for comic effect, ridiculing the source material and stripping it of all possible pathos. 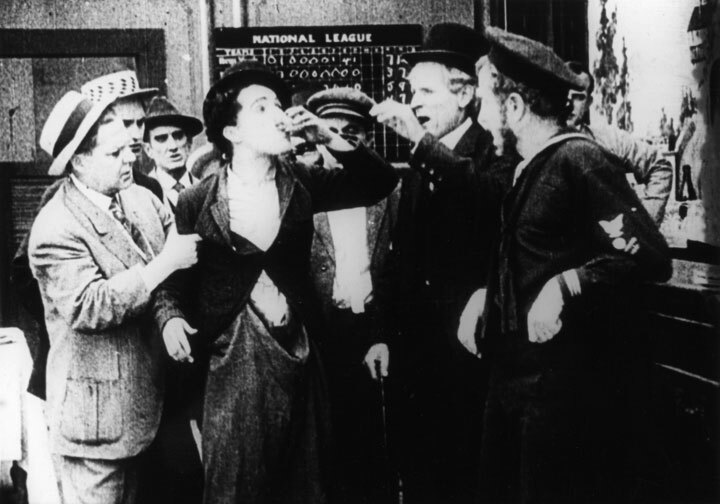 The vagabond of the poem is portrayed, of course, as Chaplin’s famous drunken tramp, belching, staggering, and stumbling as he downs drinks and imparts his weepy tale. For the flashbacks of the artist in his prime, Chaplin dresses in a full tuxedo. 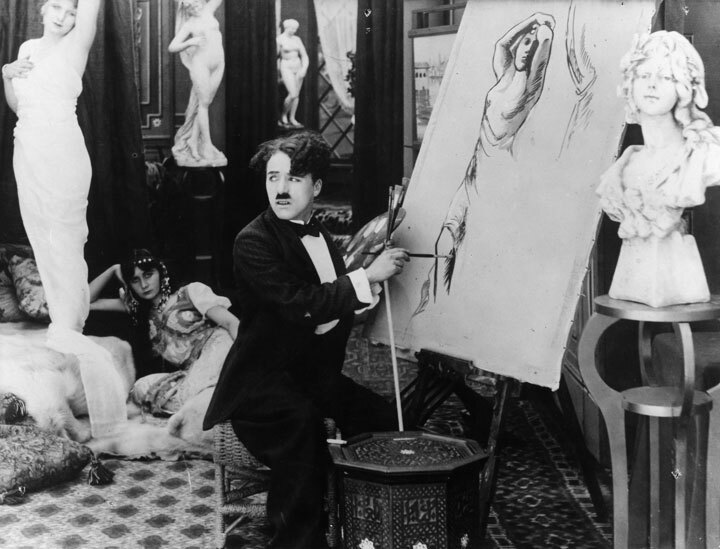 Not only does the costume amplify the height from which the vagabond fell to a ridiculous extent; it also allows Chaplin to mine the comic possibilities of a filthy artist’s studio, including distractedly dabbing his dressy duds with his paint brush and absentmindedly sitting on his paint palette. As the title cards go on to describe the fair-haired boy who stole the artist’s love, we see instead a middle-aged, balding, rotund actor with a bushy, black mustache. Upon completing his sad story, Chaplin’s tramp attempts to draw a likeness of his lady love on the barroom floor like the vagabond of the poem, but in his lubricated condition, he can only manage a sloppy smiley face. He also collapses onto the drawing, but unlike the hero of the poem, he isn’t dead. He’s simply dead drunk. While none of Chaplin’s work at Keystone is as brilliant or nuanced as the comedian’s later work, this early attempt at Mad Magazine-style* parody is both historically interesting and fairly amusing. It’s definitely better than its reputation would lead one to believe. 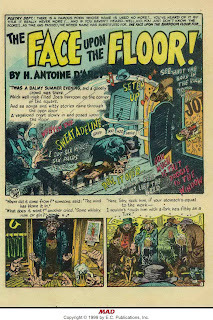 *Another parody of d’Arcy’s poem appeared in Mad #10, illustrated by Jack Davis and Basil Wolverton. 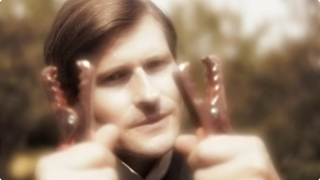 Potent Quotables--TITLE CARD: “Give me a drink – that’s what I want. I’m out of funds you know. Video Availability--The Face on the Bar Room Floor, like most of the public domain Keystone shorts, is available on numerous budget DVDs and as a free stream on the Internet. However, those videos are derived from badly decayed prints, with scenes obviously assembled in the wrong order. An effort is currently underway by the British Film Institute to restore all of the Chaplin Keystone shorts, so the Keystones will eventually be available on video in improved condition. In the meantime, the best available reconstruction of the short is available on YouTube and is embedded above. Similarly Sauced Cinema--Chaplin next got drunk with fellow comic Fatty Arbuckle in the Keystone classic, The Rounders (1914). I apologize for the lack of reviews lately. 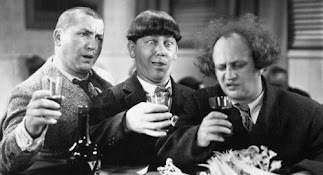 Your affable guide to alky-centric film has been struck by a monster cold. I did, however, feel it necessary to pull my ailing body from the comfort of couch to let you know that Drunk History has returned to HBO's Funny or Die Presents (a show that apart from the Drunk History segments has been much more "die" than "funny"). Last night's installment featured a history lesson on Tesla and Edison, narrated by Duncan Trussell after drinking a six-pack of beer and a half a bottle of absinthe. 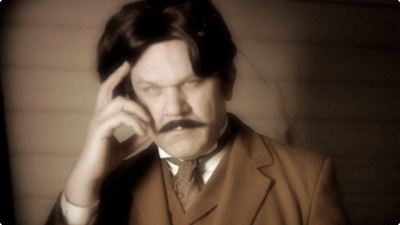 Nikola Tesla is portrayed by John C. Reilly and Thomas Edison is Crispin Glover. Check your listings or consult your DVR to catch the repeats. 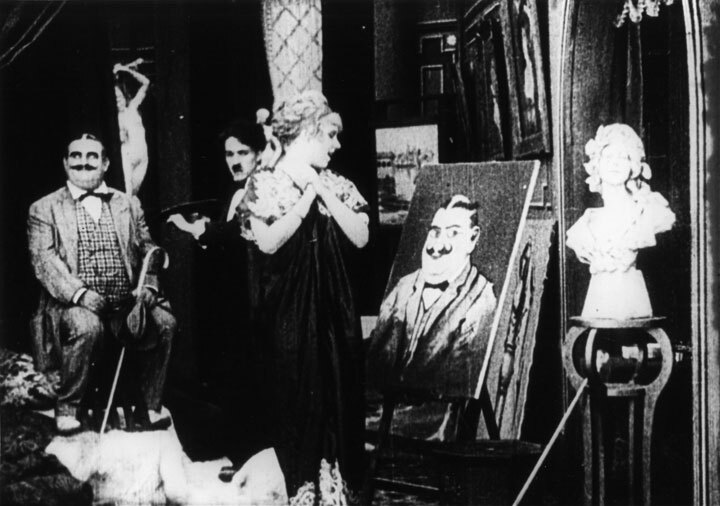 Hopefully, I will return later in the week with a review of Charlie Chaplin's The Face on the Bar Room Floor (1914). I the meantime, it's back to the couch (sniffle, cough, sniffle). 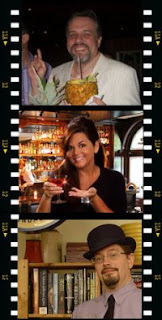 Booze News: Tickets for Tales of the Cocktail are now available! 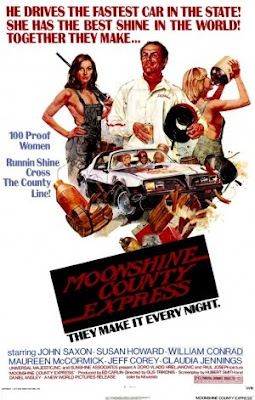 In the meantime, I will return later this weekend with a review of the 1977 drive-in flick, Moonshine County Express.